Forgive the cliche, but pictures really are worth a thousand words. My last post about colonial herbs was hopefully informative and helpful, but y’all would be better served if the facts came with some photographs. 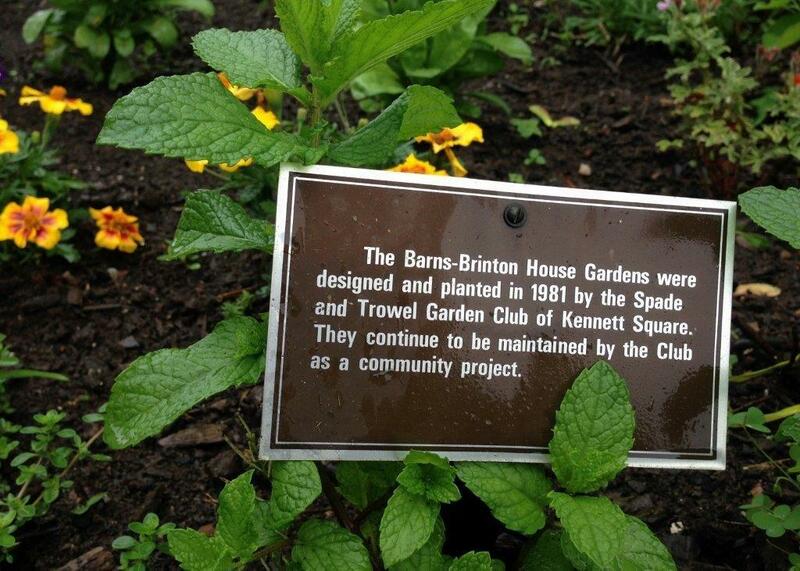 a tribute to our wonderful founders, the Spade and Trowel Garden Club of Kennett Square! 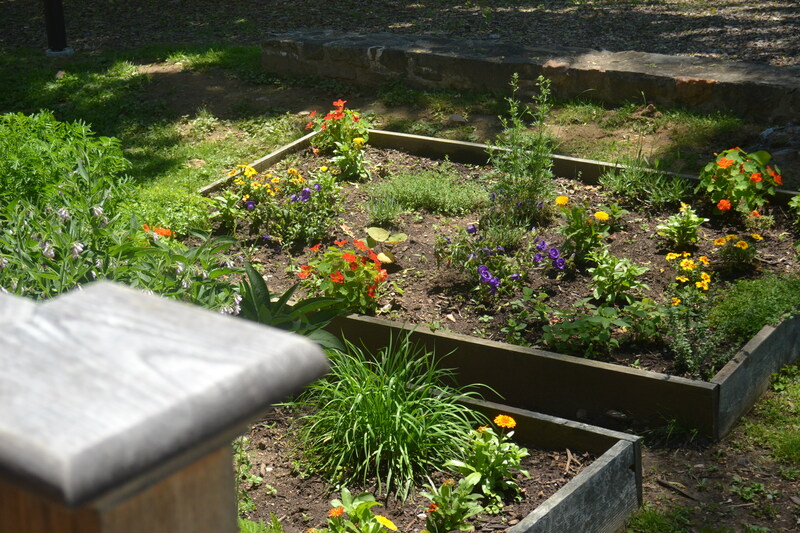 Those photographs are all of our lovely garden at the Barns-Brinton House. 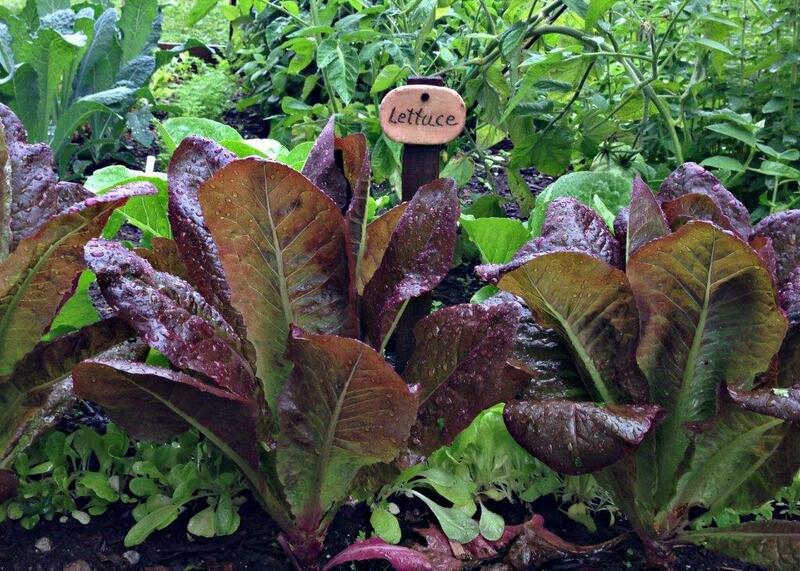 Mrs. Elizabeth Barns and her only daughter, also named Elizabeth, would’ve grown a garden very similar when they were still alive and used the results for various purposes, including food and medicine. Of course, if you haven’t seen my tidbit on Herbs of Colonial America, please do check it out. And definitely definitely definitely come see our Barns-Brinton House (Sundays and Saturdays, 1-5) to see the herb garden in person! Categories: Uncategorized | Tags: add-on, America, calendula, chives, colonial, colonists, garden, growing, herbs, history, lettuce, mint, museums, photographs, pictures, plants, thyme | Permalink. have our gardens in front of the structure. Trying to still be as authentic as possible, despite the relocation, the garden has mostly herbs and vegetables. 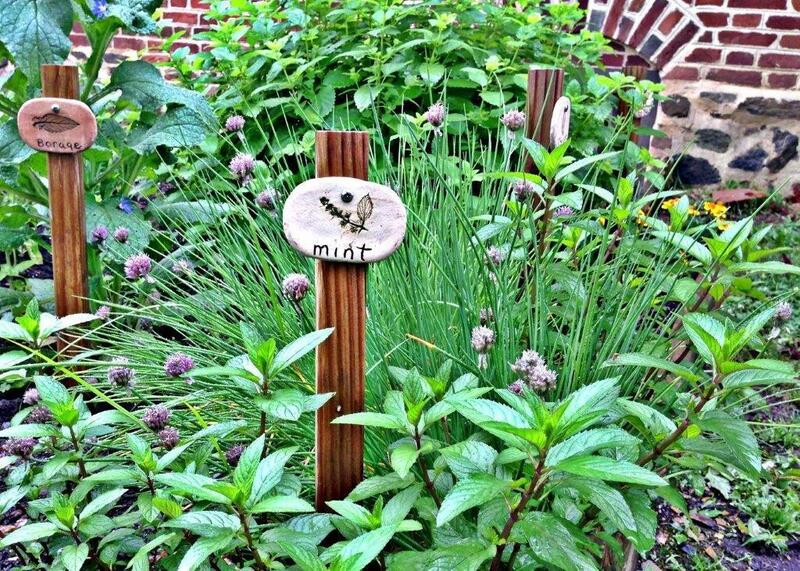 Herbs were grown during colonial times and used for a myriad of reasons, such as cooking, dyeing, and making medicines. Of course, the uses differ with each herb. 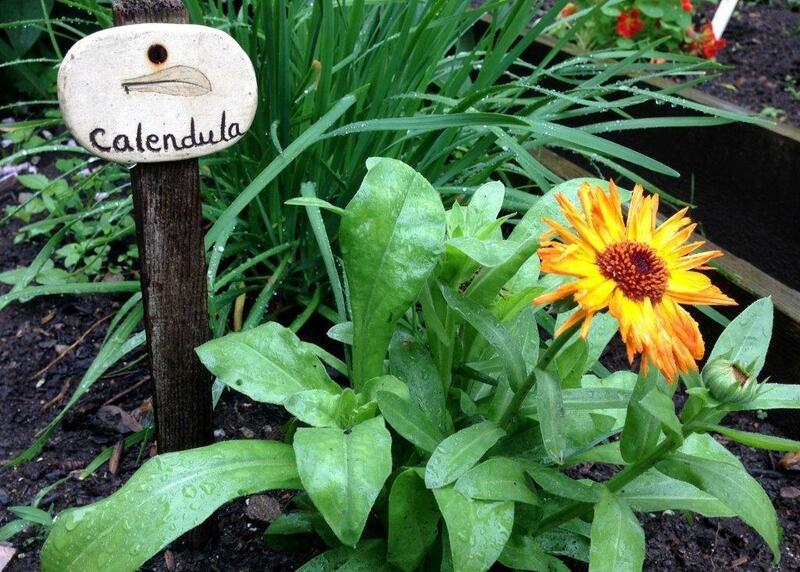 One of the many herbs that we grow is the calendula, also known as the marigold. It blooms throughout the summer, so it will be keeping our summer visitors plenty of company. Their flowers have skinny petals and are a yellow-orange color. First introduced in England in 1573, they began to appear in what we know call the United States, in 1642. When used for dye, they produce yellow or brown, depending on the type of mordant. Another herb is the spearmint. It produces small, light purple or white flowers throughout the entirety of the summer down from the top of the stem. 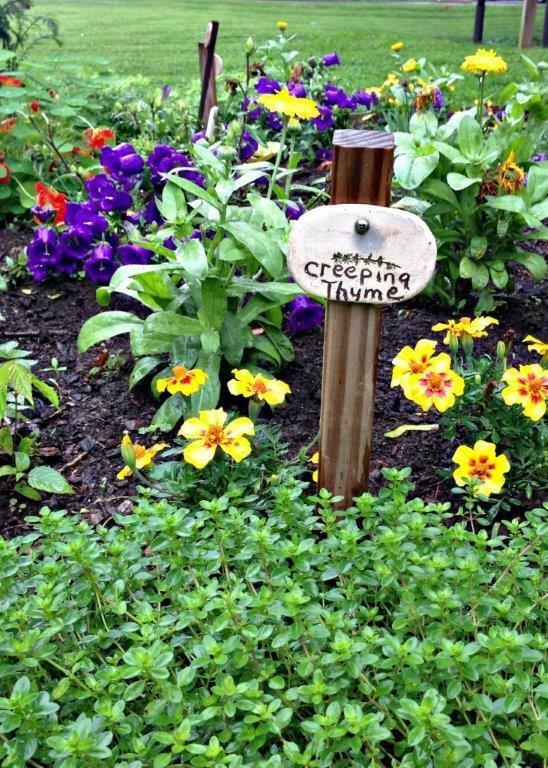 It has no stalks, differentiating it from peppermint, which has short-stalked leaves. The spearmint is widely accepted to be a native plant of England, though some wonder if it had been imported by the Romans eons ago. However, we do know that it was found in Plymouth, Massachusetts, one of the earliest colonies in the Americas. Because of its fresh scent, it is often added to teas. Nowadays, we might even find it in soaps. 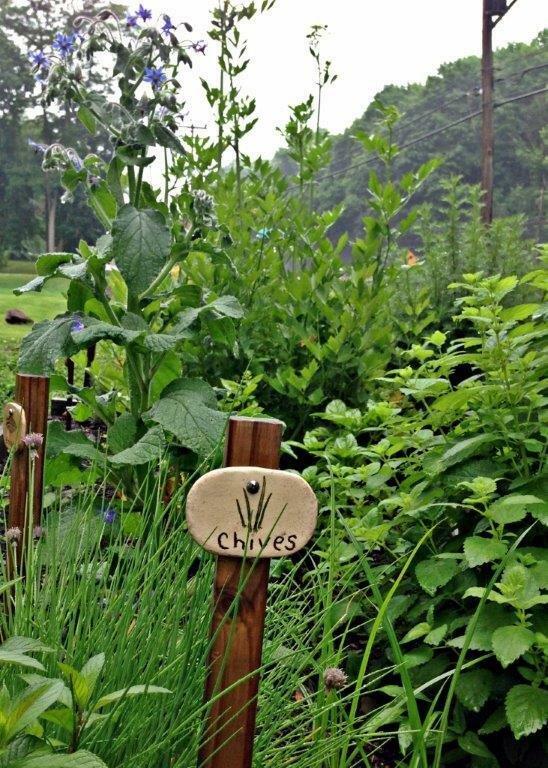 Of course, we grow many other kinds of herbs. The oil of lavender, or lavandula, was used for medicinal purposes, especially during World War I. Bloodroot is a native to the United States, and was used by Native Americans for medicinal reasons as well. In the Barns Brinton House, the family parlor is situated right next to the public tavern room on the first floor. We imagine Elizabeth Barns there with her daughter, also named Elizabeth, putting the herbs from their gardens to good use by the fireplace. Information comes from Raymond L. Taylor’s “Plants of Colonial Days” and the Brooklyn Botanic Garden Record Plants & Gardens’ “Dye Plants and Dyeing”. Categories: Uncategorized | Tags: bloodroot, calendula, culinary, dye, garden, gardening, herb, herbs, lavender, medicine, mordant, museum, peppermint, plants, preservation, spearmint, vegetables | Permalink. Historical myths are common. Facts can be exaggerated out of proportions. However, to be able to effectively learn from our past, we must cling on to the truth, no matter how tempting fabrications may seem. That is why, in 2006, the Daughters of the American Revolution Museum have chosen to battle myths and set the record straight. Published by Mary Miley Theobald, “Stuff and Nonsense: Myths that Should Now Be History” delineates their results. One of the most common beliefs is that people were shorter during the 18th century. This misconception stems from the fact that their beds look shorter than ours do today. Visitors to many historic houses, like the ones operated by the Chadds Ford Historical Society, naturally jump to the conclusion that people back then must be shorter. With the lack of regulation and organization during colonial America, having standard sizes was unheard of. Beds were individually crafted, not manufactured in bulk in factories. However, most beds were made to seventy five inches, which is still a standard size bed today. However, the high bed posts and the way the pillows are placed often create the illusion that the beds were much shorter. Another common legend is that women often died from their petticoats catching on fire. Yes, women had to wear long petticoats. Yes, women often worked around a fire. However, death by petticoats was not the norm. The leading cause of death was disease, thanks to a lack of understanding about medicine and hygiene. Women, having grown up around the fire in long dresses, have simply learned to live and adapt. Alden O’Brien, a Daughter of the American Revolution curator, explained that: “the horrified nature of the accident may have made the rare incidents more famous and memorable, making them stick in people’s minds and seeming more common”. The last common misconception is that people didn’t build houses with closet because of the closet tax. This myth has one simple explanation. People living in colonial America put their clothes in chests or drawers. Closets were built usually on either sides of a fireplace and were used for storage in general. The fireplace in the parlor of the Barns-Brinton House has these closets, and we still use them today! Visitors mistake these closets for cupboards, and then assume that people just didn’t have closets. We know from history that there has been a lot of taxation on the colonists by Britain, but a closet tax has yet to be discovered. In addition, people had fewer clothes back then. Therefore, they needed less space. Myths are easy to fabricate. At times, it may be tempting to make history more fun by adding embellishments. However, the most important thing about studying the past is studying the truth. All the information comes from Mary Miley Theobald’s “Stuff and Nonsense: Myths That Should By Now Be History”. So wrote Dr. Merril Smith, formerly a history professor at Temple University, regarding marriage expectations during the very first years of American colonization. However, as ideas began to change and the threat of a war against Mother England loomed, so did approaches to marriage. The traditional way held its ground in the face of rapid changes. Love was seen as a result of years of marriage, not a factor in choosing a spouse. Husbands must act with love and gentleness towards their wives, but ultimately they were the leaders of families. Wives should guide their husbands by their virtue and grace, while submitting to the men’s decisions. Of course, certain societal mores act as inhibitors on the husbands’ power. Neighbors and family members often became involved when a marriage grew physically abusive, sometimes by interfering directly or acting as witnesses in courts. For example, neighbor John Lewis once had to restrain John Evans from kicking and beating Evans’s wife, Sarah. However, flaws in this traditional approach soon arose. Since the men were the heads of the family, they had ultimate say over all matters, including management of finances. However, in poor families, the women often worked as well, leading some wives to want a say in budgets. Many husbands also wasted money on alcohol, impoverishing his family. In other cases, it might simply be that the wife could do a better job. Aided by revolutionary propaganda, a second viewpoint gained popularity. The Quakers have always seen marriage as a partnership of equals, and the Revolution encouraged the same thinking. The choosing of one’s own spouse is a statement against tyranny and a fight for individual liberty. An advice column in 1774 advised a woman, who found herself having to choose between two suitors, to marry the man she loves, as long as he is financially sufficient. Here, one sees a growing emphasis on personal feelings, but only as long as he can provide. It seems that pass a certain threshold, the importance of wealth gave significant ground to affection. During the late 18th and early 19th century, both views of marriage often came to head, especially when one spouse holds one mindset and the other believes the other mindset. In those cases, the two must learn to live together, compromise their values, and work as one despite their competing ways of thinking. While divorce was available, it was uncommon. Many, when in an unhappy marriage, either gritted their teeth and bore it or simply abandoned their spouses. In colonial America, it was much easier for men to desert their wives, as they had more means and were less noticeable traveling alone. However, some women did manage to find help with family members. After a wife deserts her husband, he may, as many husbands did, put a notice in the newspapers. The notice served two functions. One: it was a way for him to portray himself as the blameless victim. Second, it told the world that he no longer had any duties to maintain her. She had left him. She chose to give up on his support, both legally and financially. He was free from any obligations to her. Yet many did sue for divorce. 236 women and 131 men filed for divorce before the Supreme Court from 1785 to 1815. The majority of men (64%) cited adultery as grounds for divorce, no doubt influenced by the Great Awakening’s championship of the ideal “passionless” wife. The higher rates of wives is surprising since divorce was riskier for women. There was always the danger that if a woman lost her divorce case, that her husband would either refuse to take her back or mistreat her even more than before the case. Even if she did win, a woman’s societal status would be diminished greatly by divorce. She would be an outcast. She would have less of a chance to remarry. She would have fewer resources to support herself and any children who may be dependent on her. Therefore, the bed and board divorce may be a better option for some. The bed and board divorce provided the wife with alimony, while a full separation would not. However, it would also inhibit her from remarrying. Of course, we still have these issues today in marriage. Who has the final say on budgeting? If marriage is a partnership, what happens when the partners can’t agree? What are the pros and cons of obtaining a divorce? That’s one advantage of studying history. You learn that there have been hundreds of men like your husband. All information comes from Merril D. Smith’s “Breaking the Bonds” (1991). Categories: Uncategorized | Tags: abuse, adultery, America, colonial, divorce, domestic, family, history, husband, laws, love, marriage, Pennsylvania, Quakers, wife | Permalink.